Fire. Flood. Mold. Age. A toddler with a crayon. There are a number of things that spell disaster for family photos, many of them holding irreplaceable memories. But, photo recovery is sometimes just as scary. Photos lost in the mail. Disreputable companies. Big charges,for an image that couldn’t even be recovered. Photo recovery with The New Camera House is different. With our in-store photo fix in Lismore, you don’t have to trust the mail system with your photos—you’re leaving them in the hands of Australia’s largest photography company. And if we can’t fix it, our satisfaction guarantee means you’ll get every penny back. 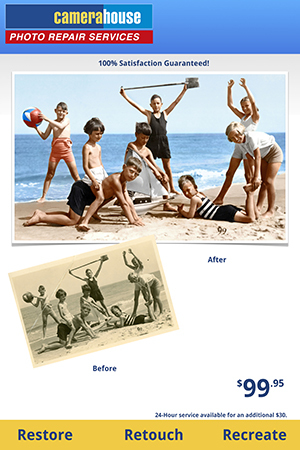 From rescuing damaged photos to recoloring antiques, our team of photo recovery experts can handle even the toughest fixes.  We’ll scan the photo into our system. Nothing is applied directly to the image, so you’ll still get your original back. 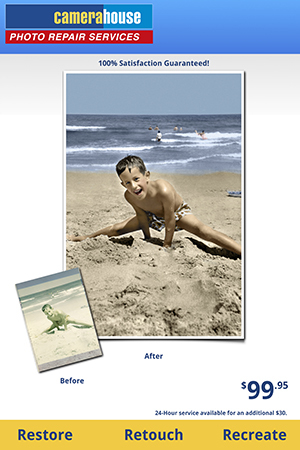  Our skilled photo editors digitally correct the image, fixing water spots, seaming tears, even replacing missing pieces of the image and adding color to an old black and white, if you’d like.  We’ll put the corrected image on a disk as a digital copy, or print it for you. 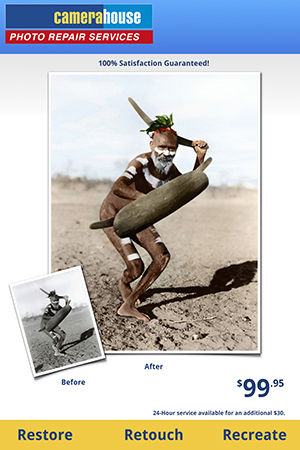  Every photo recovery includes unlimited revisions—if you’re not happy, we’ll go back and continue working with your image until it’s perfect, or your money back. $99 photo recovery with unlimited revisions and a money back guarantee—that’s The New Camera House.